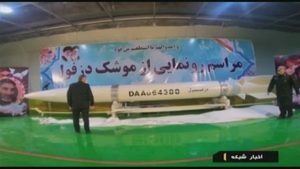 IRAN (NBC) – An Iranian news outlet says the elite Revolutionary Guard has inaugurated a surface-to-surface ballistic missile it claims has a 620-mile range. The missile, dubbed Dezful, is a version of the Zolfaghar missile that has a 430-mile range and a 992-pound warhead. Iran has missile capability of up to 1,250 miles, far enough to reach archenemy Israel and U.S. military bases in the region.